Kingston area Rotary's $6,500 was matched and rematched by the district, by TRF and by CRCID to a total of US$24,500. The five clubs chose a Matching Grants project with the Rotary Club of Naivasha, Kenya and the Bethany Crippled Childrens Centre, to do corrective surgeries on 70 children—all "victims of war"—from the Kakuma Refugee Camp. With this money, Dr. Dan Poenaru operated on, not 70 children, but 107 children. 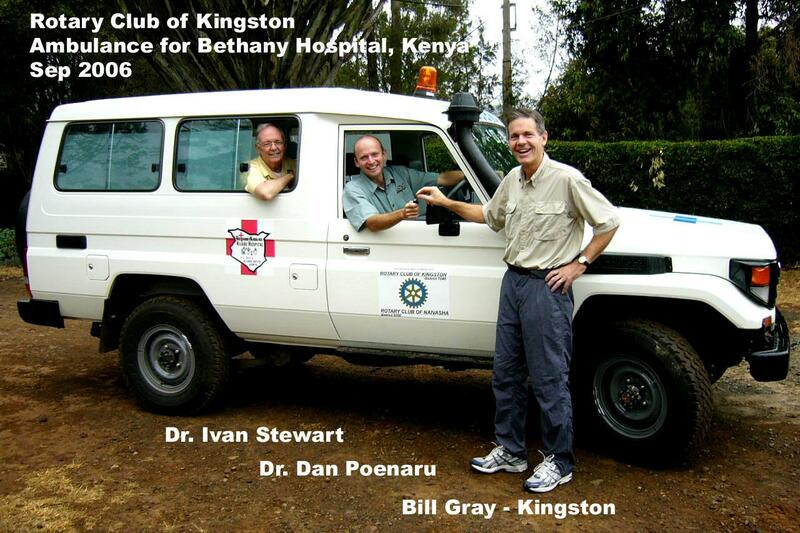 In the interim, the need for an ambulance was identified by Bethany Kids to transport children and their parents from the Kakuma Refugee Camp in Northern Kenya to the hospital. The Kingston club raised $31,000 to purchase the ambulance. Greg Welch was chair of the World Community Service Committee which dedicated the club’s fundraising over two years towards this purchase. Ongoing funding for the Bethany Crippled Childrens Centre came from a Gala, which David Ibbott chaired for many years. Today, Kingston Rotarians continue their support. Kingston Rotary club did the fashion shows for 7 years; in that time they raised over $62,000 for Bethany Kids. like Cataraqui-Kingston's donation of US$6,000 to treat 150 children with Spina Bifida.